AnyMP4 iPod to Mac Transfer Ultimate 7.0.22 Free Download - Transfer iPod files to Mac and iTunes; backup iPhone SMS, Contacts. Transfer iPod files to Mac and iTunes; backup iPhone SMS, Contacts. AnyMP4 iPod to Mac Transfer Ultimate is the most wonderful iPod to Mac transferring software to transfer all iPod files to Mac for backup. With this program users can conveniently copy music, movies, TV shows, podcast, iTunes U, ringtone, ePub, PDF, audio books, camera roll, picture, voice memos, camera shot, etc files to Mac. Apart from that, this iPod to Mac Transfer Ultimate can sync iPod files to iTunes and backup iPhone SMS and Contacts on Mac. Moreover, this software supports any other version Apple portable devices, like iPhone 5s/5c, iPhone 5, iPad4, iPad mini and latest iOS7. AnyMP4 iPod to Mac Transfer Ultimate can help users backup iPod files iPod files (music, movies, TV shows, podcast, iTunes U, ringtone, ePub, PDF, audio books, camera roll, picture, voice memos, camera shot, etc.) to Mac with fast speed. Statement: First, please download the orginal installation package by clicking the download link. Of course you may also download it from the publisher's website. Using AnyMP4 iPod to Mac Transfer Ultimate crack, key, patch, serial number, registration code, keygen is illegal. The download file hosted at publisher website. We do not provide any download link points to Rapidshare, Hotfile, Depositfiles, Mediafire, Filefactory, etc. or obtained from file sharing programs such as Limewire, Kazaa, Imesh, Ares, BearShare, BitTorrent, WinMX etc. Software piracy is theft. 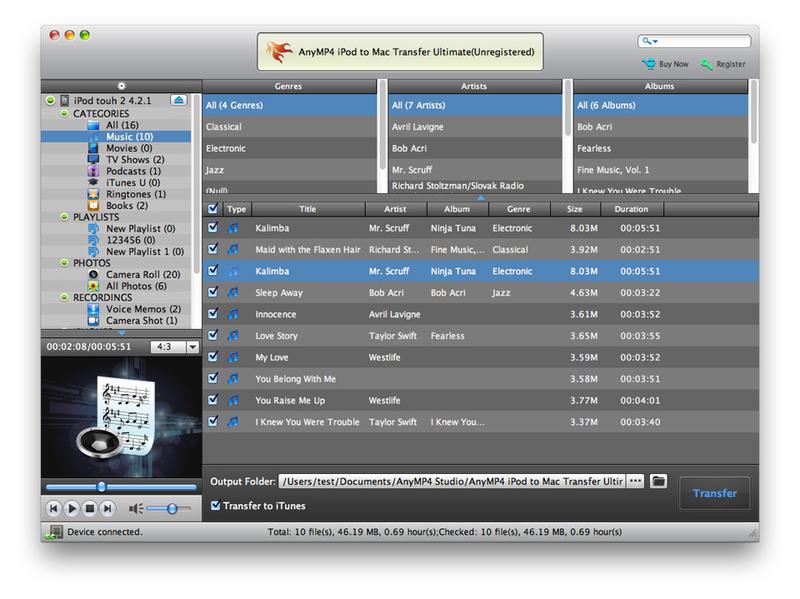 If you like AnyMP4 iPod to Mac Transfer Ultimate please buy it.